One of the first toys that I remember playing with is a vintage PLAY-DOH food making set and it is one of my treasured memories of childhood. I love that PLAY-DOH has stood that test time because it is now a favorite way for my own three children to express their creativity! I was excited to learn that the publisher Silver Dolphin Books is now featuring PLAY-DOH in a fun line of children’s books that promote early learning including the First Concept series. PLAY-DOH: Mama’s Little Ducklings is a cute lift-the-flap board book which features a loving Mama duck searching for her little duckling while promoting counting, shapes and colors. The fun vibrant colors, interactive lift up flaps and engaging illustrations are perfect for babies and toddlers who are sure to delight in this adorable book. 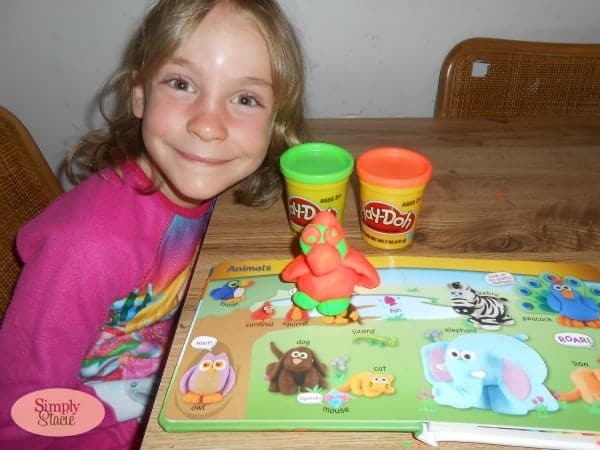 Two of my young children are learning to read so they love PLAY-DOH: My First Words which is a padded board book that includes 50 commonly used words with fun illustrations and accompanying text. 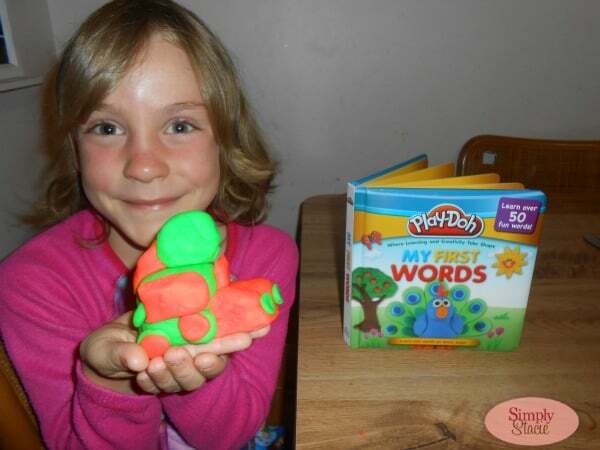 My six year old daughter practices reading the words to her younger brother and they both love the bringing their favorite book characters to life with their own PLAY-DOH recreations. PLAY-DOH:Counting Bunnies (SRP $6.95) is a fun and creative way for little ones to learn their numbers. This sturdy board book features ten whimsical bunny rabbits that get children counting from 1-10. This is another book that is perfect for my early reader to gain confidence by practicing reading this to her little brother and both of them have a blast learning too. 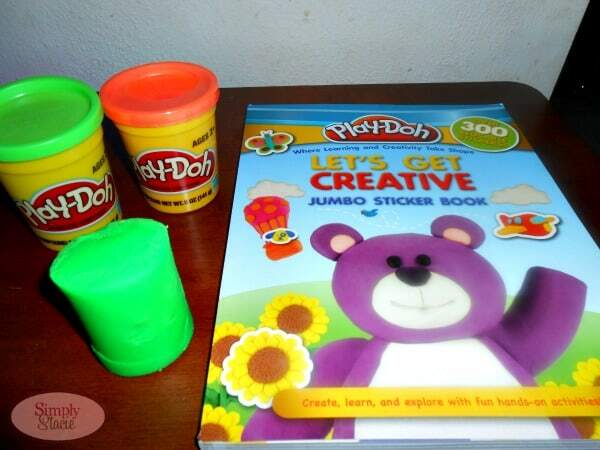 The PLAY-DOH: Let’s Get Creative Jumbo Sticker Book ($12.95) was a huge hit with all three of my children as it includes a whopping 300+ reusable stickers and over 100 pages of interactive fun. This PLAY-DOH First Concept book series is a wonderful gift idea for toddlers, pre-school aged children and young children as it can help promote an early love for learning and creative expression. Don’t forget to include a few tubs of colorful PLAY-DOH to make it even more fun! You are invited to visit Silver Dolphin Books to browse the entire PLAY-DOH book series titles as well as additional high quality children’s books. Since we are currently in the dinosaur phase, he would love Build the T. Rex . Alice in Wonderland, my favorite. Build the T Rex book. My niece would love Alice in Wonderland. Thanks! My grandsons would like the Build the T. Rex book. I like the Animal Adventures: Rain Forest book. I’d like to have the Billy Bunny and the Butterflies book for my grandchildren. The kids would like the Super Sweet Big Book of Activity Fun! I think my kids would love to read 3D Explorers: Safari Animals. Nature Trails: In the Ocean , definitely! We want Alice in Wonderland. Thanks! My son would also love “Nature Trail: In the Ocean”! My godson would love to read Build the Human Body. I like the 3-d explorer solar system book. My son would love the Pretend and Play: On the Farm book. Any of the Little Critter Apps or books ! She would like the Nature Trails: In the Ocean. My son would love Build the T. Rex .